The west-coast state hasn’t carried out an execution since 2006, but 25 inmates have exhausted all of their appeals. 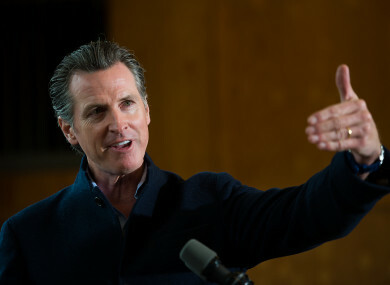 CALIFORNIA GOVERNOR GAVIN Newsom will today impose a moratorium on carrying out the death penalty in the US state, granting temporary reprieve to the 737 inmates on death row – the largest such group in the country. Newsom is a Democrat who took office in January and a long-standing opponent of the death penalty, which was last carried out in California in 2006. “The death penalty is inconsistent with our bedrock values and strikes at the very heart of what it means to be a Californian,” Newsom will say, according to prepared remarks from his office. “The intentional killing of another person is wrong. And as Governor, I will not oversee the execution of any individual,” he will say. The governor plans to sign an executive order to block the death penalty in his state. It will also withdraw California’s lethal injection protocol and close the execution chamber at San Quentin prison, his office said. It does not provide for the release of any death row inmates from prison. A quarter of all those on death row in the United States are in California, according to the governor’s office. Twenty-five people on California’s death row have exhausted all of their appeals. Human Rights Watch said that with the governor’s decision, California continues a trend in the United States away from putting people to death. The state joins Colorado, Oregon, and Pennsylvania, which have similar bans, and 20 states that have abolished the death penalty, it said. “Governor Newsom has demonstrated great courage and leadership in ending the cruel, costly, and unfair practice of executing prisoners,” said Alison Parker, US managing director at Human Rights Watch. Email “Temporary reprieve for more than 700 death row inmates as California suspends executions”. Feedback on “Temporary reprieve for more than 700 death row inmates as California suspends executions”.